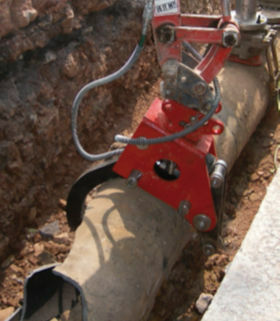 The MACAW Pipe Crackers are versatile cast iron pipe breakers that can be attached to an excavator's digging arm or used as a standalone tool to easily remove old main. Much safer and faster than using sledge hammers or handheld tools. 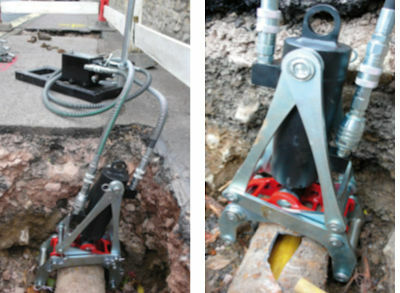 Safe: The squeezing action is controlled remotely from the cab or road surface to gently break the pipe, preventing flying debris. Advanced Design: Highly maneuverable and does not require full circumferential access. Fast: Cracks pipe in much less time than traditional methods. 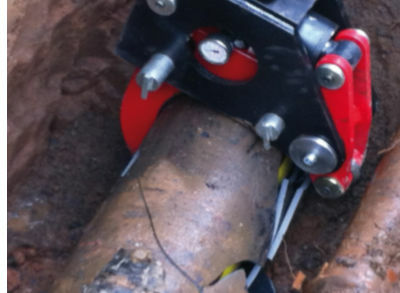 Efficient: The operator has precise control over the pressure applied to the cracker jaws to easily break the pipe into pieces, leaving inserted PE pipe undamaged. The Mini MACAW can be attached to an excavator or operated on its own, powered using a hydraulic power pack or a hand pump.